The July 2014 Scanfest will take place here at AnceStories this coming Sunday, July 27th, from 11 AM to 2 PM, Pacific Daylight Time. This past week, I came across a fabulous new-to-me resource: the Internet Archive Lending Library. 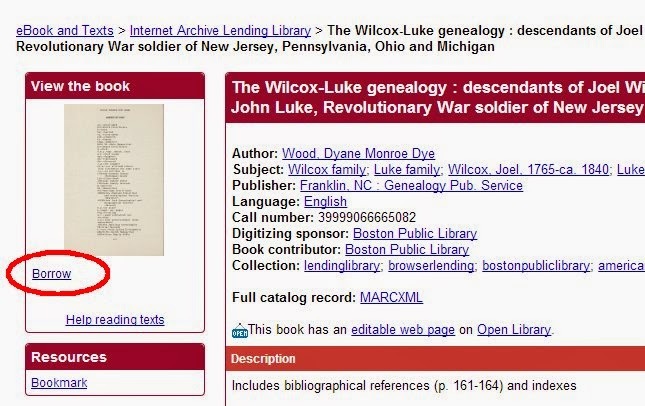 Now, if you've been doing genealogy for a while, you probably already know about the Internet Archive, a repository of free digitized out-of-copyright books and documents: books that have your ancestors' names in them; city directories; county histories and biographies; church membership and history books; fraternal organizations' membership lists; newspapers; and vital and cemetery records books, just to name a few. 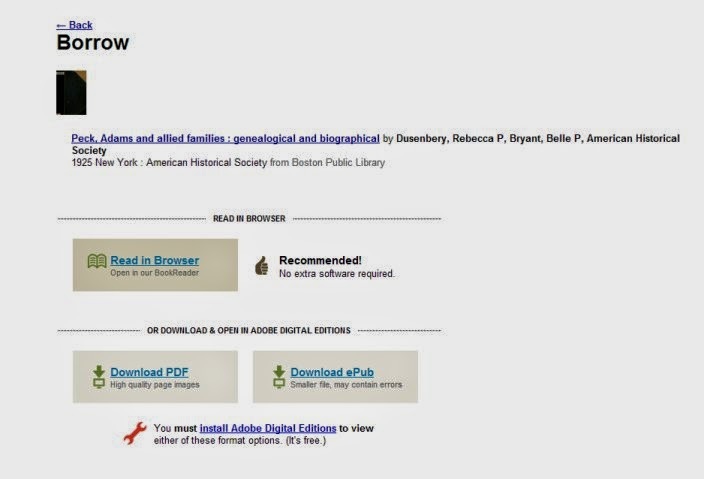 You may also be aware of the Internet Archive's Wayback Machine, a handy tool for finding digitized archives of those obsolete genealogy websites that may have had part of your family tree on them. There are even video and audio files, and live music. There's historical software, and vintage video games, and TV news. You could spend days, weeks, years browsing through the goodies on this site, and still never glean all its treasures, because it is being added to in great quantities, daily. But did you know that besides all those great, free, out-of-copyright books, you can also access some that are still under copyright? Think about it! 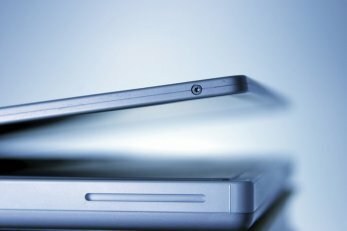 No more waiting for weeks for an Inter-Library Loan book to arrive at your public library. No more restrictions on where you can access the ILL, as some lending libraries require you only access the loan inside the borrowing library's building. Yes, you can access these books in the comfort of your own home, in your jammies. Here's how you get to the goodies. Go to the Internet Archive Lending Library link. You may wish to bookmark it. Click on the "Account" tab in the top menu. You'll need to log in. If you aren't already a registered user, click on the words "Join us" to the right of "Anonymous User." Now return to the Lending Library main page. A good place to start is to click on the "Browse by Subject / Keyword" link. You'll then view this page with an alphabetical list of subjects. I use the CTRL+F feature (hold down the Control [CTRL] key while clicking the F key to bring up a search box for the page) to search for subjects I'm interested in. You'll note that "genealogy" only brought up one hit. "History" brought up 57 hits. "Family," however, brought up 1,267 hits. Clicking on these subject links brings up the list of titles within that subject category. You can then click on the title link for more information about that book. Once you find a book you'd like, click on the "Borrow" link underneath the slideshow of the book images. If it is available, you'll be prompted to either read the book in your browser (the easiest option, as you won't have to download software), or download and open it with Adobe Digital Editions. This is free software that you can install right from that page. If the book is not available, you'll get a notice that it's already checked out, and you'll need to try again later. Putting a book on hold is not possible right now, although the Internet Archive website states they hope to add it in the future. Now there are some restrictions. Remember, these are books that are still under copyright. You can't copy the books to your computer's hard drive. You can download five books at a time; each will expire after two weeks and automatically be "returned" (removed from your device) when that time period expires. The Frequently Asked Questions link is in the left-hand menu of the Lending Library main page, or you can go directly to the FAQ page here. Now go find a good family or local history book to borrow! This is one of my children's paternal grandmother's lines. According to the Dictionary of American Family Names at Ancestry , the name REDENBAUGH is an altered spelling of the German "Redenbach" or "Rettenbach;" these are habitational names from any of various places in Bavaria and Austria named Rettenbach. I have seen it spelled as "Redenbo" in some records. Ahnentafel #220 - Henrich "Henry" REDENBAUGH (c. 1874 - 1828) - born in Hamburg, Germany, he married Margaretha Jane BARNHART (c. 1735 - 1828) in Germany before 1776. Henry served in American Army during the Revolutionary War from Cumberland Co., Pennsylvania. He and Margaret both died in Hamilton Co., Ohio. They were buried near the west line of their farm in Section 27, near Reading, Hamilton County. Ahnentafel #110 - Frederick REDENBAUGH (1773 - 1856) - born in Germany, he married Anna Margaret HANEY (c. 1768 - 1852), another German immigrant, in 1790 in Pennsylvania. By 1840, they were in Scott Twp., Montgomery Co., Indiana. Frederick died in near Crawfordsville in Montgomery County. Frederick Redenbaugh...was a native of Germany, came to this country some time during the last century, and first located in Pennsylvania, whence he moved to Ohio, and from there to Indiana in the early days of the settlement of the state. After coming here he first settled among the pioneers of Jefferson County, and then came to Montgomery County, where his life was closed at the advanced age of eighty-six years [sic - he was not quite 83]. He was a soldier under Gen. Harrison at the famous battle of Tippecanoe, and he served with the General during the war of 1812. He married Margaret Haney in Pennsylvania, and they had twelve children, of whom their son William, who lives in Fountain County at the advanced age of eighty-one years, is the only survivor. [He] was an ardent Democrat in his day, and was a leader in local politics. Ahnentafel #55 - Hulda REDENBAUGH (b. c. 1808 - 1890) - born in Ohio, she married William DAILEY (c. 1794 - bef. 1880) in 1826. It's not known where they married, but the first of their 14 known children were born in Rushville, Rush Co., Indiana. In 1840, the family was found in Scott Twp., Montgomery Co., Indiana, and by 1849 they were located in Green Twp., Parke Co., Indiana. In 1851, however, they were in Wapelo Co., Iowa and in 1853, Fremont Co., Iowa! In 1880, Hulda was living in the household of her son, Samuel Dailey, in Fremont City in Fremont County. 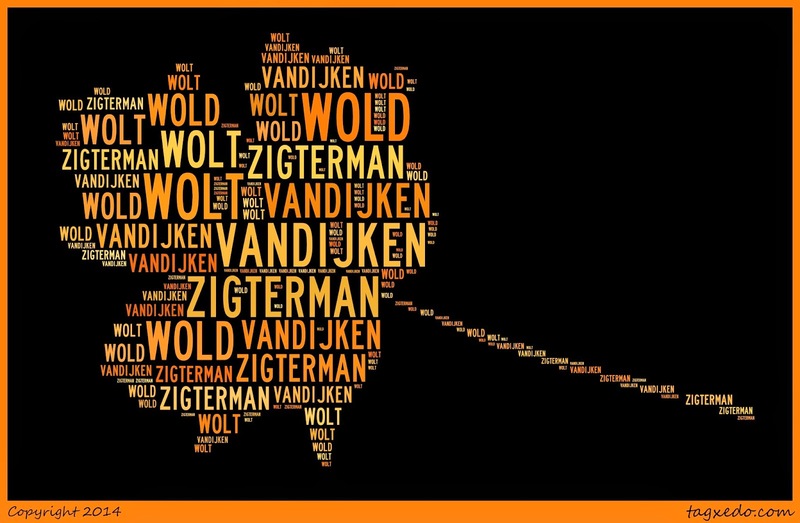 WOLT, sometimes spelled WOLD is apparently the Frisian form of wâld, which means forest. It is one of my maternal step-grandfather's surnames. The earliest WOLD ancestors I can find originated in the province of Groningen, in the villages of Westeremden and Bierum. Ahnentafel #110C - Siert Jans WOLD (b. 1804) - born in Westeremden, Groningen the Netherlands; married Antje Alberts van DIJKEN (b. 1802) at Bierum, Groningen in 1824. Ahnentafel #55C - Anje WOLT (b. 1829) - born in Bierum; married Klaas ZIGTERMAN at Bierum in 1854; six known children. At least two of their children, Trientje ("Catherine") and Zigert ("Silas") immigrated to Western Michigan. I thought I would share with you a postcard from my personal collection. This was given to me by my cousin, Steve Robbins, in a box of personal Robbins family papers. 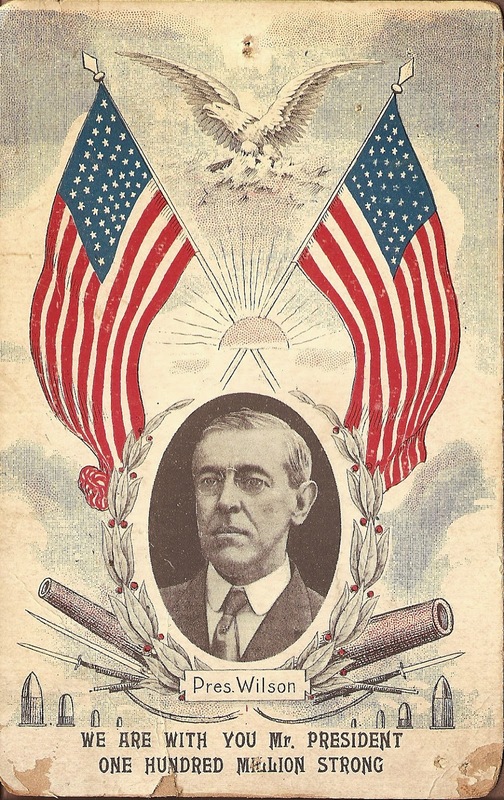 I thought it was appropriate to use this year, not only because of the flags, but because this year marks the 100th anniversary of the beginning of World War I, a reference which is made in the caption of the postcard above. Wishing each and every one of my fellow Americans a safe and enjoyable Independence Day!